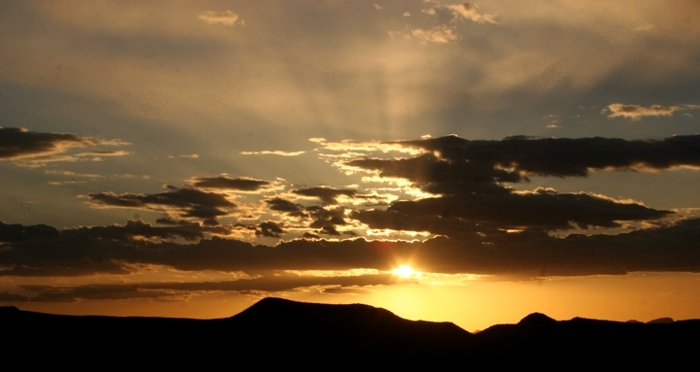 Crepuscular rays are those “beams” of light (and shadow) that can often be seen at sunrise or sunset. It’s a beautiful effect that I’ve posted about before. See: Crepuscular Rays and Crepuscular Rays + Silver Linings. I caught the above display a few weeks ago and decided to share it. As I’ve often said … sometimes Sky Lights is more about pretty pictures. For a display like this to happen, you obviously need a cloud partially covering the Sun. Irregularities in the shape of the cloud selectively allow or block sunlight creating the pattern of light and dark streaks. You also need some haze, humidity, or dust in the air to make the rays visible. You can’t really “see” light passing by unless there’s something in the air to scatter the light toward your eyes. It’s the same thing that happens with a laser pointer aimed into the sky at night — in really clear air it’s difficult to see the beam. But in “bad” air the beam is easily visible. The divergence of the rays is an optical illusion caused by perspective. You get the same illusion with parallel train tracks that appear to converge in the distance. Given the great distance to the Sun, the rays are actually very close to parallel. If the rays extend far enough to be visible overhead, they’ll appear parallel as they pass above you. And if the rays extend even farther you’ll see them converging — a phenomenon called anticrepuscular rays. That’s not as common because it requires near-perfect conditions over the entire sky. I’ve only seen it a few times. There’s a nice image of anticrepuscular rays on the Atmospheric Optics website. And here’s another beautiful example from APOD. If you like “pretty pictures” check out Atmospheric Optics. You’ll see hundreds of stunning images from around the world. Plus, the author Les Cowley provides detailed explanations for the various classes of optical phenomena. I drop by his website often just to see what’s new. Spend some time there, and I guarantee you’ll start noticing cool things you’ve been missing in the sky.